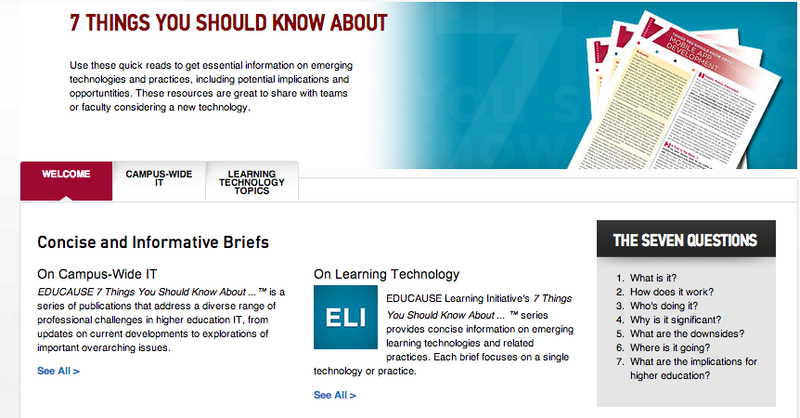 What we like best about this resource is it’s 7 Things You Should Know…” series, which published this Fall its 100th two-page brief on “emerging learning technologies and related practices.” We also found six more ELI resources to point toward as teachers move into thinking about next term’s courses, and as we reflect on what worked in – or could work better or could be incorporated into – our courses that make use of technology tools to support learning and teaching. With an initial brief on social bookmarking, the series debuted in May 2005 to consider ways technology tools might support teaching and learning in higher education. Since then, briefs have focused on tools (lecture capture, WordPress, iPad apps, open textbooks), approaches (collaborative learning, gamification, collaborative learning spaces), and practices (social content curation, privacy, assessing online group learning). Why dip into this resource regularly? Granted, making use of the ELI Search capacity when you’re considering or trying out a new tool or approach is helpful and easy, I’ve found that clicking to explore the publications a coule of times a month has helped me to respond to classroom situations (when teaching in “active learning” and “regular technology” classrooms), to address specific student questions (the “what do you think about using this tool for that task” query that comes as students test personal technologies for learning purposes), and to make good choices when I adapt assignments each term (for hosts of reasons). To inspire technology innovators – by sifting through technology developments to identify those apt for teaching and learning. To support new technology users – with straightfor­ward, nontechnical, balanced discussion to help readers evaluate a particular technology’s benefits. To extend learning – about ways technology tools can play roles in the work of teaching and learning. To bridge gaps – whether between faculty and students, academic and IT departments, or higher education and the workplace. To guide information technology priorities – guidance in making the case for / decisions about particular technologies. To spark localized publications – as departments, teams, or individuals investigate and test a particular technology, they build on these briefs to suggest possible localized uses, resources, consultants and case studies. We’re always talking about the learning-based merits of teaching with writing – merits in the writing and peer feedback processes, in the asking for and synthesizing feedback from teachers, and in the realm of providing multiple measures by which we can guide and assess student learning related to course outcomes. We also talk – often and openly – about how this can be difficult to manage: in a large course, in a fully online course, when students are learning to move from basic to complex rhetorical formats and feedback practices. This brief has helped me think about how I might begin to employ an automated, anonymous, rubric-based, peer-feedback and self-assessment in large and small, online or hybrid or inperson courses. Where the 7 Things series has already made it possible for teachers, learners, and IT professionals to review a precise, informative two-page brief rather than wade through an over-abundance of resources, this new – and still quite small – series provides a one-page follow up to select earlier briefs. Topics taken on so far are these: on makerspaces, multimedia assessments, flipped classrooms, and badges. Each brief presents seven electronically available resources with an evocative title, brief annotation, year of publication and hyperlink. Yup, this year my Future Faculty students are creating more multimedia assignments within the courses they develop for future semesters – and completing more of them for me, and I’m working with first year teachers who are incorporating small- and large-scale multimedia assignments into their courses. Time to learn more about assessments suited to these robust assignments, and about possibilities for peer-, teacher- and self-assessment practices. The resources highlighted here will lead readers to learn more about rubrics, copyright guidelines, production considerations, incorporation of images, platforms students might use, and building assignments from solid pedagogical frameworks. Interested in learning more about Social Media as a Primary Source: A Coming of Age? In redirecting students who come to you and say, “I always stick with the first thing that comes up on Google…”; Where People Go for Information, What They Use, and Why? Or maybe you want to understand, The Credentialing Economy: Transformed by and for Its Beneficiaries. Or perhaps ready for Starting the Conversation: University-wide Research Data Management Policy. These articles are similarly timely, jargon free, and carefully linked to higher education. Look to the left side of the page, then click “Teaching and Learning” – from there you’ll find a taxonomy of Educause research and publication topics with listings of relevant sub-headings and closing with highlights of most recent resources at the bottom of the page. This week those features docus on Quality Matters as a broadening initiative, on flipped classrooms, and online learning. 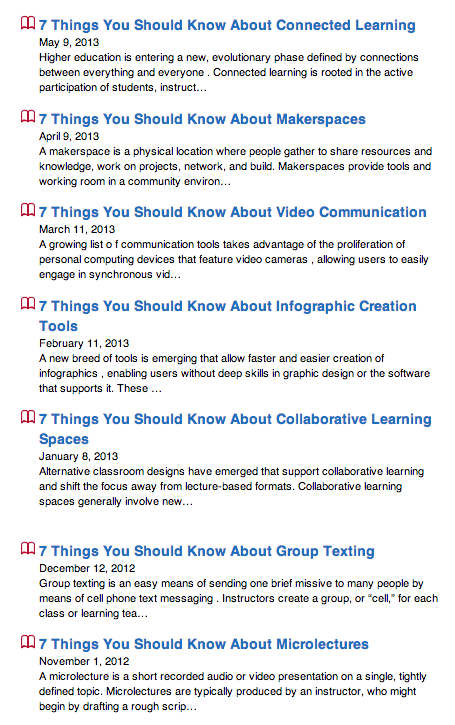 And, now on to finding your own 7 reasons for consulting Educause resources!